I wanted sophomore year to be different, but this was a little much. Emma Allen couldn't be more excited to start tenth grade. Not only is she the assistant stage manager for the drama club's production of Hamlet, but her crush, Brandon, is directing, and she's rocking a new haircut that's sure to get his attention. But soon after school starts, everything goes haywire. Emma's suddenly promoted to stage manager, her best friend, Lulu, stops talking to her, and Josh-the sweet soccer player who's been cast as the lead-turns out to be a disaster. It's up to Emma to fix it all, but she has no clue where to start. One night after rehearsal, Emma stays behind to think through her life's latest crises and distractedly falls through the stage's trapdoor . . . landing in the basement of the Globe Theatre. It's London, 1601, and with her awesome new pixie cut, everyone thinks Emma's a boy-even Will Shakespeare himself. Dropped into the middle of the original production of Hamlet, Emma gamely plays her role as backstage assistant, jumping at the chance to experience theatre history and rub shoulders with legends. But the Globe's Hamlet has its own problems, and once Emma starts traveling back and forth through time, things get really confusing. In which reality does she belong? And can she save two epically tragic productions of Hamlet before time runs out? In this sweet, surprising novel full of laugh-out-loud hijinks, debut novelist Molly Booth will have readers on the edge of their seats, ready to stand and applaud when the curtain falls. 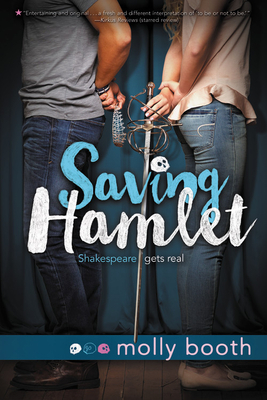 Molly Booth is the author of Saving Hamlet and Nothing Happened a total Shakespeare nerd. In high school, she was a stage manager for three different community theatres, which almost killed her. She graduated from Marlboro College and went on to study more Shakespeare (twist!) at University of Massachusetts Boston. Molly is a freelance writer and editor and has been published on TheMarySue.com, McSweeneys.net, HelloGiggles.com, and various other websites. She cohosts a Bard-centric podcast, Party Bard, and directs a lovely, hilarious, and fierce group of homeschooled teen Shakespearean actors. Molly lives in Massachusetts, where she spends a lot of time with family and friends, and the rest attending to her queenly cat and loaf-of-bread-shaped dog. You can visit her online (please do!) at mollybooth.com.